I have many left . Fabricated out of 24oz stainless travel mugs. Great for making your coffee AND drinking it. The plastic inner mug shown below is heavy duty with a threaded top and sliding closure to keep your beverage warm. The shape and design of these Woodstoves makes a consistent, concentrated (narrow) cooking flame when top lit or lit from the middle in more adverse conditions. 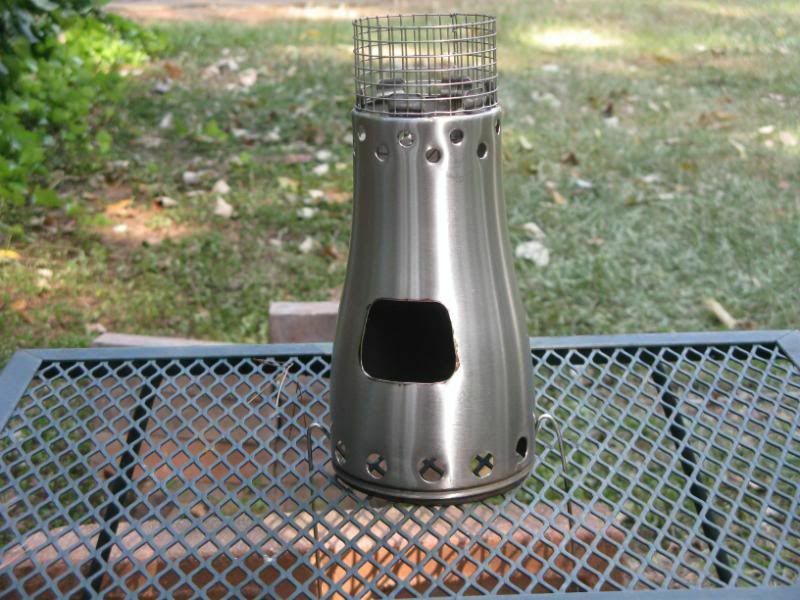 They also work great with any top jetted alcohol stove such as Zelph's custom Cobalts, or Starlytes. One of these will last for MANY years with heavy usage. This 24oz size is perfect for group cooking because of its LARGE fire box, but works great with smaller pots too because of the tapered shape. 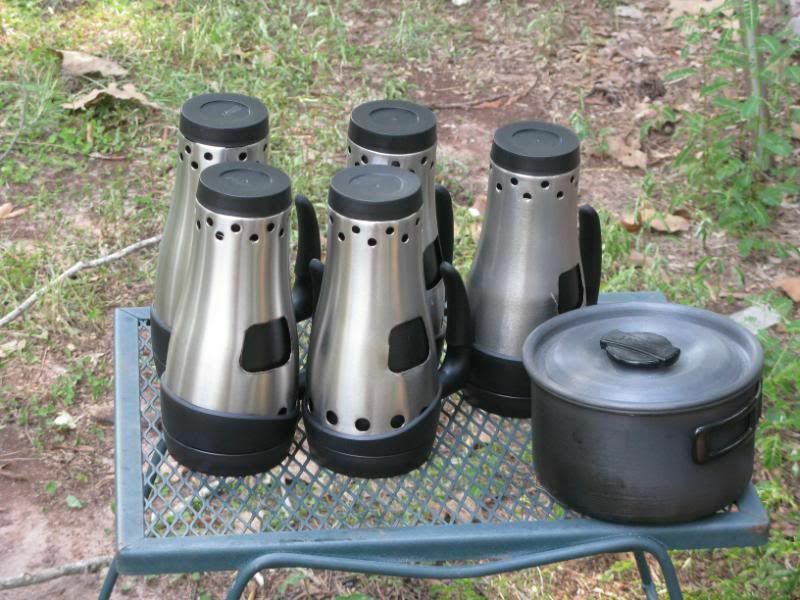 Weight of whole kit-8 oz (stainless stove body-3.5oz....cup,top, potstand-4+oz) (I will remove the handle by request for a one oz savings) When the Stove is completely assembled it is essentially bombproof, but the Stainless Firemug Stove is sturdy enough to leave the inner cup or top at home to lighten your pack. Boils Many cups of water very quickly for Cooking/Sterilization with JUST ONE SMALL LIMB LOADED IN ONE BATCH. Keep adding fuel through the lower hole for an unlimited burning time. Easily Bake or Simmer with the secondary coals for long periods. Just add a twig or two every five minutes to the coals. Comes with a detailed, illustrated set of instructions to help get the most out of your Woodstove. 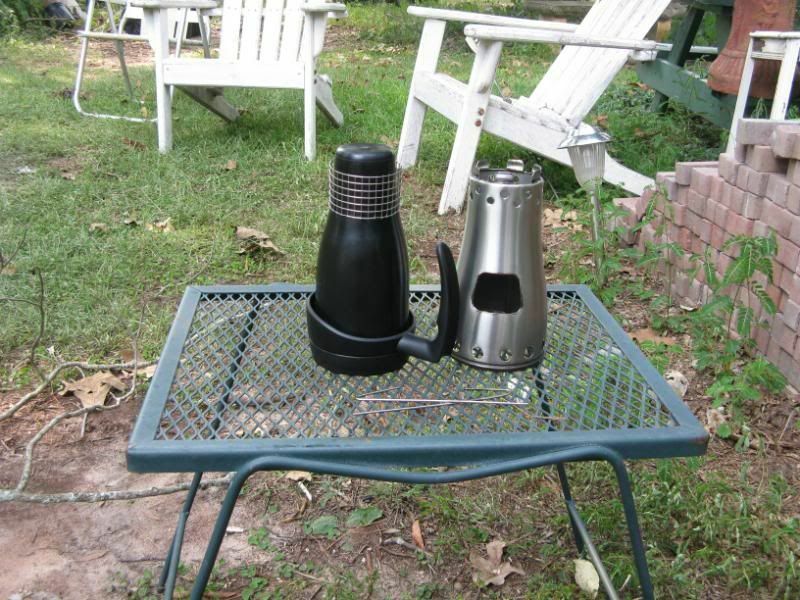 Note: As with ALL woodstoves or Alcohol stoves, Some sort of wind block is required in windy conditions. 45.00 PLUS SHIPPING anywhere in the Con U.S. I also have many, many more of all sizes...just contact me through email (brent@driggersengineering.com) or PM. note: the discoloration in the picture around the hole in the picture is sharpie marker and will disappear with the first burn.